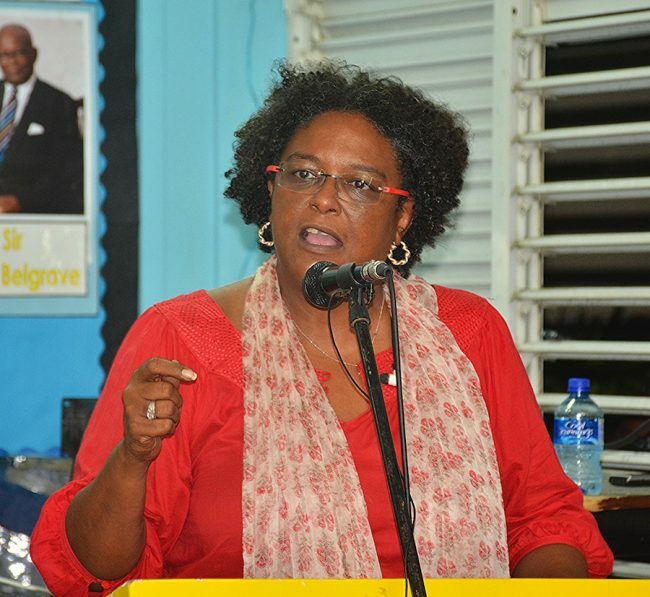 Opposition Barbados Labour Party (BLP) leader Mia Mottley is urging party supporters to keep the pressure on the governing Democratic Labour Party (DLP) and not to be sidetracked by “rumours” and “lies”. Mottley last night addressed the controversial issue of her possible involvement in the general election campaign in St Lucia. A number of political observers and politicians, including St Lucian Prime Minister Kenny Anthony, have accused Mottley and Barbados Labour Party (BLP) operatives of being involved in political activity in that island ahead of today’s poll, a straight fight between Anthony’s St Lucia Labour Party (SLP) and the United Workers Party (UWP) led by Allen Chastanet. Anthony Astaphan, an advisor to Dominica’s Prime Minister Roosevelt Skerrit, also questioned Mottley’s recent visit to Castries and her apparent support for the opposition there. Mottley has denied involvement, telling a meeting of the BLP St Philip branch last night that during her visit to the sister Caribbean Community (CARICOM) island, “I ain’t canvas, I ain’t walk, I ain’t went pon no platform. I ain’t speak publicly, I have done what all good students of politics do”. However, while she did not make direct reference to the Freundel Stuart administration, the Opposition Leader urged supporters not to be distracted by persons seeking to divert attention away from the political situation at home. “There is a movement building in this country, and therefore the rumours, the lies, and the cursing will come faster and quicker . . . . It is a sign that we are on the right track. Nobody throws stones at an empty mango tree,” she said. The BLP leader also said she saw nothing wrong with Caribbean politicians campaigning for other politicians in sister states. Mottley listed a number of past and present examples of cross-territorial activity by regional politicians, including senior and retired members of her own party; Dominica’s Prime Minister Roosevelt Skerrit, who she said spoke the SLP’s platform and the minister in the office of Jamaica’s Prime Minister, who appeared in support of the UWP. “That’s what happens in the region where people are close,” she told party supporters. Though I agree with you Mia, inconsistency creates suspicion. It is alleged that to one party you said, “i’m on holiday, while to this newspaper you said you went to see a client.” Which one is it? You are well aware that the crushing of your political bones is desired by members of both sides. It’s national knowledge now, so why do you constantly place yourself in these silly little positions. You have to be smarter and more patient, you will not get to the promised land unless you walk through the wilderness. So either get battled hardened in the wilderness or stop walking. The little manipulative games you probably played in the past with success is not suitable for one who aspires to the highest office in this country. Well said and very accurate. She draws too much negativity because she simply creates it. We were not distracted by your failed sponsored walk either and take no comfort in the result of the St Lucia election results,it will not be same for you. I do not have to tell you how I feel about you. I have said many times that it is in you to be an excellent leader, but, but , but, but, it is also in you to be a terrible one as well. Which of your two sides you turn too will determine the outcome of your stewardship. Controversy is never too far away from you because you tend to create most of them. Even when you appear innocent, your past deeds will always make you guilty. You will do well to guard against your indifferent self. It’s that indifference that easily allows you to do the despicable and suggest the unthinkable. Humility is a fitting attribute besides the ability to talk well. Learn it and apply it and you will see how easily you are elevated to the level of best leader.